The new arrival of the Moto Z family with Shattershield display was introduced in Europe at the IFA 2017. We've had the time to give the Moto Z2 Force a closer look under our magnifying glass together with all its modules. Is it worth buying? Does Motorola still have something to say in the top-of-the-range market? Let's find out! Lenovo Moto phones: Which one for you? The Moto Z2 Force was announced by Lenovo on August 24. The device hit the market with a price tag of $720 without any Mods, so you might want to look into getting this one through your carrier. The model will be sold in Super Black, Fine Gold and Lunar Grey (this one is only for T-Mobile customers though). With this price tag, the Moto Z2 Force is punching at the weight of other wallet-busters such as iPhone X, Pixel 2 XL, Note 8 and LG V30. Motorola used to be a smartphone heavyweight, that's true. And the company is gunning for a comeback. But can the Moto Z2 Force it hold its own among the top tier flagships today? The Moto Z2 Force is reminiscent of the Z2 Play in terms of its appearance. The body is made of aluminum and the rear camera comes in its trademark circular and slightly protruding module. What impressed me a lot was the lightness of the device, although it is still solid and well built. Don't get used to it, however, the smartphone is designed to be used with the company's Moto Mods system. When paired with any module you get the opposite sensation, the smartphone then feels (in different ways depending on the module) somewhat heavy and cumbersome. Fortunately, a Kevlar Shell Style module is included in the sales package to compensate for the camera's protrusion. In the back of the smartphone we find the contact pins for the various Mods so it is not recommended to use the smartphone "bare" without a module or cover to prevent damage. We can therefore say that although the camera protrudes, it will never bother you as your smartphone will always be equipped and protected. The front is covered with a protection that Motorola calls Shattershield. This processing, which guarantees strong resistance to falls and shocks, makes the front panel slightly protruding and you can feel it by grasping the smartphone and passing your finger on the edges that because there's almost a sharp ridge around the display. Unfortunately, the protection makes the panel very prone to scratching, being composed of a material less hard than Gorilla Glass. The Moto Z2 Force display has a resolution in QuadHD of 1440x2560 pixels and is POLED type. The POLED panels are designed to be flexible and therefore better suited to make the ShatterShield screen fall resistant. In practice the panel is composed of several layers: the first aluminum, followed by screen, touchscreen and a glass cover. The panel is bright enough to be read on sunny days but is not the brightest display I've ever seen. The contrasts and angles of view are excellent as per OLED tradition. The colors are just as good, not too saturated and faithful to the originals. It's a nice smartphone for viewing multimedia content such as photos, videos or games. The design is classic, with a16:9 ratio surrounded by large bezels. I don't understand complaints about the presence of bezels in the upper and lower part of the display as if it hadn't been normal until today. Motorola has not yet made the leap into the futuristic 18:9, but this smartphone still offers a truly enjoyable display. The only defect I found is in an annoying jelly effect in vertical scrolling of content such as lists, Facebook or the app drawer itself. It's really light, almost imperceptible, but once noticed you can't miss it. The contents seem to compress with the scrolling speed and then expand again as you slow down. Yes, I know, I'm a nit-picker! As with every smartphone in the Z series, we find support for Moto Mods. Not much has changed in the range of modules, we find the usual interesting ideas already seen at the time of the first Moto Z with some small novelties. Of the Mods available I tried True Zoom, Insta-share Projector, 360 Camera and Gamepad. As already mentioned, these are all interesting ideas, but with a high cost: if we add the cost of any Mod to that of a smartphone, we get even closer to the $1000 mark. For this price the rivals of Moto Z2 Force are definitely more attractive aesthetically besides offering something more in terms of features, camera or battery. The True Zoom module is far from being a good camera. The same goes for the Moto 360 Camera, which proved to be a good attempt but with unsatisfactory results (especially for 360 degree photos). The Gamepad is very cute especially thanks to the extra battery that allows you to play longer but not many titles support it (e. g. Need for Speed No Limits). The only really satisfying Mod that is the Insta-share Projector that allows you to project your smartphone screen on a wall. Personally I have used it to watch some episodes of some television series that I follow while remaining quite satisfied. However, I would never use it to watch Interstellar or other similar movies that I still prefer to see on a beautiful high quality TV. The strength of this smartphone is its modularity. Is the gimmick worth the cost? Apart from some very specific use cases I can say no, and this is a pity. Don't misunderstand me, I think that the Chicago company is on the best track and its module concept is a success compared to the competition. However, the variety and usefulness of these modules is still questionable and far from being indispensable. The version of Android that we find installed is the Nougat 7.1.1 Nougat with the November patch. Don't worry, the update to Oreo is already well on track, so much so that it is already available in beta version in South America. Motorola's customizations are very few and concern above all the Moto app features that I've already mentioned in the Moto X4 review. There is no support for the Moto Key that could arrive with the update in Oreo. It's also possible to use the fingerprint reader with gestures instead of having the software buttons on screen navigation: as already mentioned in the review of Moto X4 the mechanism is confused and we will often return to the home trying to go back or multi-tasking. From a purely software point of view, Motorola's phone is a somewhat boring smartphone, not necessarily a bad thing. With near stock Android you won't find opulent live wallpaper, a theme manager or advanced features as you might find, for example, on Samsung devices. This simplicity brings as an advantage the system's lightness, reactivity and excellent multitasking (the smartphone will rarely close the open apps, even if we have many of them). Personally, I appreciate a clean system more than flashy gimmicks that make the system heavier and slower in everyday life. Moto Z2 Force is equipped with the best hardware available at the moment. We find a SoC Qualcomm Snapdragon 835, an Adreno 540 GPU and 6GB of RAM that guarantee the same flawless fluidity as smartphones with the same chip. The system is always responsive, fast and even the most demanding games run without thought. Unlike the competition, we still don't find any support for virtual reality, for docks that can turn your smartphone into a PC or for advanced image processing systems. All this power is therefore a bit wasted except for with some games. The chip is able to do much more than we can demand from this Motorola. Interestingly, Motorola has chosen to equip the smartphone with a very fast internal memory as we are usually used to seeing on Huawei smartphones like the Mate 10 Pro. This ensures that apps and games are uploaded very quickly and a smoother overall experience in writing and reading data from memory. Moto Z2 does not aim for superior audio quality, at least not on its own. The only loudspeaker present is the one used for calls, which increases the volume when necessary to act as the main speaker. There is no 3.5mm jack output for headphones, so you'll need to rely on Bluetooth or a Type-C USB headset. As far as Bluetooth audio is concerned, you won't find the best codecs such as aptX HD or LDAC that will only come with the Android Oreo 8.0 update, so far you'll have to settle for the simple aptX. The smart phone's smiling photographic compartment features a pair of 12MP sensors with f/2.0 aperture (one RGB and one black-and-white) in combination with an autofocus laser and a pair of dual tone LED flashes. It is not a new technique to pair a monochrome sensor with the main one to increase the detail of the photos taken, nor is it a new technique to use both sensors to create a bokeh effect. The results are quite disappointing for the price range. 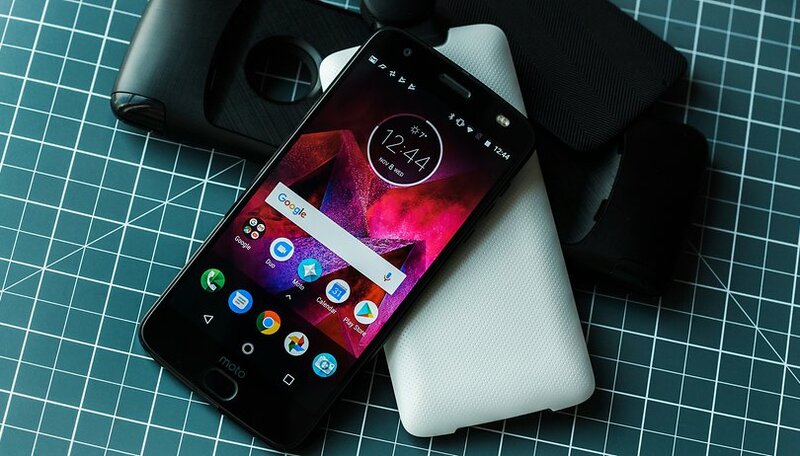 Motorola would have played well enough against the competitors of the last generation but, in a 2017 in which computational photography has taken over and smartphone cameras have reached a very high level, Moto Z2 Force does not stand out in the crowd. The photos are not completely bad, probably if I couldn't compare them with those of the other top-of-the-range tops I would be happy with the result but the competition from Note 8, Mate 10 Pro, Pixel 2 XL and iPhone 8 Plus is merciless. Also the front camera of 5MP f/2.2 is accompanied by a dual tone LED flash and does what it should without astonishing. The 2730 mAh battery is definitely under par for a top of the range device in 2017. Despite this, my smartphone surprised me by allowing me to arrive at the end of the day as long as I didn't watch YouTube or play too much. Motorola also has a dedicated battery that supports the main battery when connected to a Mod. As I said at the beginning of the review the smartphone is meant to be always connected to a Mod so the issue makes sense from Motorola's point of view. The company has decided to keep the smartphone's thickness and battery low so that the smartphone is more easily integrated by the modules. Now imagine a Z2 Force Moto with 4000 mAh of battery and 10mm thick to which you can hook a Mod like the JBL SoundBoost: unmanageable. Maintaining the reduced thickness of your smartphone allows you to better manage the overall size once a Mod is connected. If you are the type of user who would like to buy the Z2 Force but not pair it with a Mod, don't expect above average battery life. In return, the Turbo Charge charger (included in the box) loads your smartphone at a really high speed, with half an hour of charging during the shower you will be ready to face an evening out with your friends. Motorcycle Z2 Force overall is not a device with major defects or problems of any kind. Its biggest flaw is also its best value: modularity. It's great to be able to count on many expansion modules for every type of need but prices are high and availability low. In addition, modules do not always offer the desired quality and many of them aren't that useful. At the same time, since Motorola has delegated many of the functions (and part of the battery) to its Mods, the phone as a stand-alone unit offers nothing really captivating. Despite everything, Moto Z2 Force is a valid smartphone with hardware in the top category. The screen is really enjoyable despite the 16:9 form ratio now considered retro and the construction is solid. Compared to the competition, we also find additional protection on the display that makes it resistant to falls but more prone to scratches. All I can say is they downgraded the battery so you would have to purchase the battery mod. The phone at 720.00 is already expensive then the mods. I really wanted this but now I'll pass!